*Strasbourg/CoE+City Hall/Angelo Marcopolo/- PanEuropean CoE's President for Local and Regional Authorities (CLRAE), Experienced ChristianDemocrat/EPP Swedish Delegate, Anders Knape, in a brief but Topical and Multifacet Interview to "Eurofora", Highlighted several Issues related to the current top level Reflexion on "CoE's Future", "70 Years after" it was created (1949 - 2019), due to be on Focus at the Forthcoming 47 Member States' Summit at Helsinki, on May 2019, at the conclusion of Finland's rotating Presidency, when it will be succeeded by France. 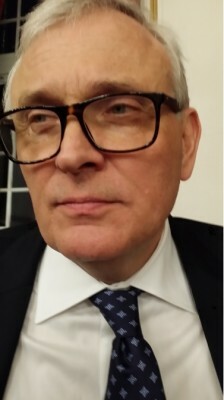 Knape was speaking shortly after a Public Debate by his CLRAE (Congress of Local and Regional Authorities of Europe), during its Plenary Session of Spring 2019 in Strasbourg (2-4 March 2019), specially dedicated to that "Helsinki Process" on CoE's Future, and CLRAE's contribution. On that occasion, inter alia, Russia's Representatives had expressed their Gratefulness to the CLRAE's co-Rapporteurs : Xavier Cadoret and Gunn-Marit Helgessen, Presidents of the Chambers for Cities or Regions, respectively, because they accepted to take into account, and integrate inside the overall CLRAE's relevant Recommendation, also the suggestions that Russian Delegates had proposed recently. 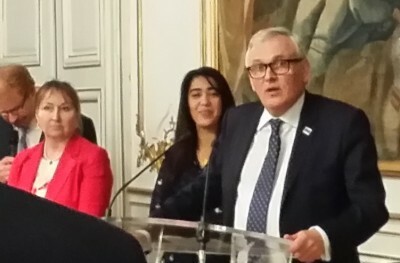 In addition, President Knape had just chaired a special Ceremony in the CoE for the Award of CLRAE's "Medal of Honorary Member" to the well known, Long-Time former Head of the Russian Delegation and vice-President of the CLRAE, Miss Svetlana Orlova, (Comp. various Orlova's Replies to "Eurofora"'s Questions, f.ex., among others, also at : ..., etc). This Contrasted with the notoriously Problematic and Harmful Division inside CoE's Parliamentary Assembly (PACE), where a Part of MEPs has managed to practicaly Exclude the Russian Delegation of MEPs from all PACE's activities, (by Depriving them from their Vote, Participatop, a.o. Rights, and Refusing to Guarantee them at least for the Future), already Since the 2014 Conflict provoked in Ukraine also by some Non-Elucidated yet factors, (See, f.ex., : ..., ..., etc), as "Eurofora" reminded. An Issue which has Recently pushed Russia to Suspend its Financial Contribution due to CoE's Budget by all its Member States, with Hard Economic Consequences on the PanEuropean Organisation's functionning, and a subsequent Risk for some to ask to Suspend Russia's CoE Membership, throwing Europe Back towards its "Cold War" Past, with UnKnown repercussions, particuarly Against Peace. Meanwhile, such a prolonged and wider series of various unprecedened "Sanctions", by EU and/or CoE, USA, etc, against Russia, on that same pretext, impacts Negatively Europe's Economic Growth, as the Experienced OCDE's CEO, Angel Guria, had already Warned in Statements to "Eurofora", earlier in Srasbourg, (See : ..., etc). - On this regard, "Eurofora" asked CLRAE's President Knape how he has succeeded to keep Relations with elected Russian delegates in Good terms vis a vis the CLRAE, despite the problems that the Ukranian issue has provoked inside PACE , (Comp. Supra). - As far as the Ukranian Issue is concerned, we (CLRAE) have already made clear our position, with a special Statement, reminded Knape from the beginning of his Reply to our above-mentioned Question. - Moreover, certain Committees' Meetings initially scheduled also in Russia, have been, in consequence, cancelled, he added. - But, at the Same Time, we (CLRAE) do Not have so Heavy Sanctions as the PACE (Comp. Supra), President Knape observed. - Thus, we can keep going Dialogue with, and Participation of Elected Representatives, as well as to Organise several other Committees' Meetings even in Russia, which allow us (CLRAE) also to Raise Questions, in addition, on what is going on inside that (CoE's Member) Country, (f.ex. on Local/Regional Democracy, etc), he observed. (He didn't yet go as far as to point to the fact that CLRAE might, eventually, play a Key Role for Peace in Ukraine, according to the Minsk Agreement, by helping to design a Compromise on the Future Status of pro-Autonomy Regions of Donetsk/Luhansk, as one of his predecessors, former President Jean-Claude Frecon, had agreed with "Eurofora": See, f.ex., http://www.eurofora.net/newsflashes/news/clraepresidentonukraine.html, etc). - Since the Beginning of his CLRAE Presidency, from October 2018, (Comp., among others, also, f.ex. : ..., etc), Knape has, indeed, organised Debates and Votes on the Main "Principles" of "Good Governance" by such an "Open Government", through "Transparency", "Participation", and "Accountability" in "Public Action", resulting in the Official Adoption of a relevant CLRAE Resolution (435/2018) and Recommendation (424/2018). 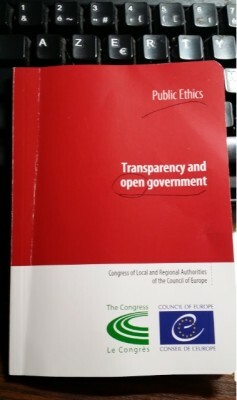 => So that, Starting from this Spring 2019 CLRAE Plenary Session, CoE's services have begun to Publish and Widely Distribute from Strasbourg a relevant handy Booklet on "Public Ethics", concerning particularly "Transparency and Open Government" according to its Headlines, which contains in full the above-mentioned Officialy Adopted Texts, as well as a comprehensive Explanatory Report, (See Photo+). - It's mainly because we have also a "Problem" with the Causes which provoque Growing phenomena of "Populism" particularly "in Rural areas" : After the problems earlier faced in Urban spaces, at present we have to address also the causes of such Populisms spreading in Rural space CLRAE's President told us. + And this is "Not at all" an eventual Reaction Only to the notorious Recent series of unusual social Events in France about the so-called "Yellow Vests" ("Gilets Jaunes"), Knape insisted, simply Because Similar Problems, mutatis-mutandis, are Currently Spreading not only in France, but Also, almost Everywhere in Many Other Countries in Europe, f.ex. in Germany with the "AfD", in Sweden with the "SD", in Austria with the "FPO", at the Netherlands, etc, and even in the USA (with the Famous "HeartLands" allegedly Dominated mainly by various Hard-Core "Conservative" Populations), etc., as he observed. - Indeed, "Expand G4 and/or G5 Digital Networks throughout all such Rural Areas is now a Must ! ", Knape strongly underlined, in this regard. - Already, f.ex., "in Sweden, the (National) Government is very Heavily Investing" in such Digital Networks' extension to Rural Territories, as he pointed out. + However, he Acknowledged also the Fact that, anOther practical Problem Often Denounced by many People Living (or who would Like to live) in Rural Areas, is that several among them are felt to be, more or less, a kind of "Medical Deserts", i.e. Under-Equiped in Medical Doctors and/or Infrastructure, at least in their close Neighborhood, as "Eurofora" reminded. - Indeed, there is often also a Problem of "Access to Health" there, President Knape observed. But this is Not always Specific to the Rural Areas, because, in Fact, some Similar Problems of current Lack of "Sufficient Doctors" are, Today, found "also inside certain Urban Areas, sometimes even in Big Cities", he denounced, (apparently pointing at an even more Fundamental Issue of nowadays Societies). - At any case, if such, and some other (f.ex. Public Transports in certain Rural spots), current practical problems are Solved, then, as various Examples in Europe, USA and elsewhere, recently show, at least the "Quality of Life" at a Natural Countryside, etc, to which Many People are Attached, may really Find Practical Ways for a Territorial "ReVival" in Rural areas, Anders Knape agreed in fine. Before the end of 2009, France and Germany will take strong initiatives to open "new Horizons" needed by Europe and the World, going well beyond the current Crisis' management, anounced French President Nicolas Sarkozy and German Chancellor Angie Merkel, reassuring that both a judgement on Lisbon Treaty by nearby Karlsruhe German Federal Court, and the forthcoming National Elections in Germany would confirm their capacity to act. They were replying to Press questions in Berlin, after key-regional elections on Sunday, where Merkel's ChristianDemocratic party kept everywhere a strong 1st and won the possibility to forge a New Majority with Liberals at the largest of 3 Landers : Saxony (4 millions inhabitants), while its main competitor, the Socialdemocrat party fell to unprecedented lows : Tackled by the small "Linke" (left) party in Saarland (1 million inhabitants), it became even smaller than it in Saxony and Thuringen (3 million inhabitants), where SPD arrived only third. While its usual partners, the "Greens" also fell down, contrary to CDU's new partners, the FDP Liberals, who go up. - "At any case, at the end of the year (2009), if things go as scheduled, we shall take strong initiatives, showing that Europe needs a Franco-German axis, as well as the World, even if it never excludes other" countries to join, replied Sarkozy to a question if France and Germany will revive the "European dream", by "relauncing the EU motor" for the Future, with actions going further than the mere management of the global crisis, (as it was done fex. in the Past with the creation of the "Euro" Monetary zone, etc). - "I am convinced that the Franco-German friendship must be constantly nourished by New Projects", he added. "There are many areas of cooperation where we intend to take, very soon, some Franco-German initiatives, which will allow to open more Horizons" to the EU, Sarkozy stressed. But if "we don't speak about that now, it's only in order to avoid interfering in important elections coming in Germany", he observed. However, "we have already started to consider the Future with the (German) Chancellor, and what we can do in order to honour our predecessors". "We are already speaking about that, and we are preparing things". 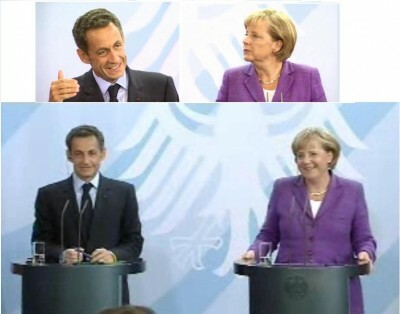 "I am working very well together with Mrs Merkel, and I wish that it goes on", Sarkozy concluded. - "It's important for EU's credibility that France and Germany advance forward together", stressed Merkel from the outset. "Don't worry about Germany's capacity to undertake initiatives" with France, she added. "France and Germany will be perfectly able to make proposals" for the EU. - "After-crisis" plans must be prepared, meanwhile, with measures "advancing progressively", Merkel anounced. And, for the short term, we must deal also with EU Citizens' dismay since they feel that it's a Scandal for some in the Financial Markets to be paid with excessive "Bonuses", etc, she agreed with Sarkozy. - "Abuses in financial markets must stop", stressed also Sarkozy. Backing Merkel's announcement that France and Germany call for an EU meeting to forge "a crystal-clear European position" in view of the G-14 Summit at Pittsburg, he warned that "everyone will have to undertake his responsibilities, in front of World's Public Opinion. particularly those who don't want to make the same effort of regulation as France and Germany". 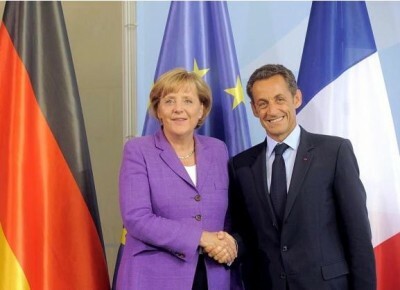 Moreover, "Global Trade cannot be correctly dealt, without taking into account also Environmental and Social rules", Sarkozy added, referring to recently expressed positions against Unfair Competition via Environmental and/or Social Dumping, (See earlier "EuroFora"'s publications). Such moves are obviously linked to the need to ensure at least an elementary respect for Human Rights by Third Countries, (f.ex. exploitation of Children's work, etc) in order to avoid, precisely, any such Social Dumping. - "EU has Values, protecting Human Rights and Human Dignity", and "it cannot close its eyes" in front of grave violations, particularly "Torture and/or killings", added, indeed, Sarkozy. Thus, "the time comes, where decisions must be taken". But, in case of "Sanctions", "all International opinion should be convinced of the need to take action", he observed. Expressed on the occasion of recent developments in Iran, the same principles should logically apply also to other similar cases, including fex. that of Hundreds of ECHR judgements' condemning f;ex. Turkey for grave crimes, (as Torture, brutal Killings, Enforced "Disappearances", Destruction of Family Homes, harassments and oppressive violations of Freedom of Speech, etc). Meanwhile, questioned on (EU Commission's chair) Barroso's bid to succeed himself for a second mandate, they both expressed a "wish" or a "feeling" that "EU Parliament"'s various political Groups might fix a date for decisions "during September". 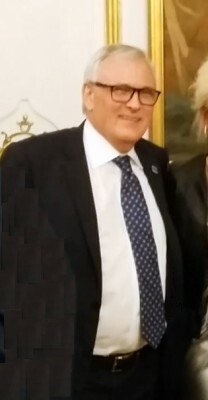 However, is he is endorsed before the entry into force of the Lisbon Treaty, it will be legally necessary to re-vote anew for a full term of office afterwards, according to EU Legal Experts, revealed recently in Strasbourg the experienced former President of EU Parliament's Constitutional Committee, German Socialist MEP Jo Leinen. And Germany will not vote for Lisbon Treaty's ratification but only "on September 8 and 18", revealed Merkel, ( i.e. after EU Parliament's plenary session in Strasbourg). - Therefore, "for EU Commissioners' appointment, it's too early yet, because we must wait for the ratification of Lisbon Treaty" by all 27 EU Member countries, including naturally Ireland's Referendum on early October, said to "EuroFora" the influential President of EU Parliament's largest group of MEPs, Joseph Daul, expressing, however, the hope that a controversial deal with the head of the Socialist Group of MEPs, Martin Schultz of Germany, might hold for Barroso alone, at a forthcoming vote due to fix the Strasbourg plenary's Agenda.